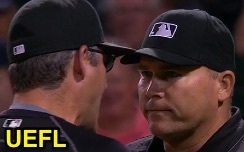 HP Umpire Mark Carlson ejected White Sox Manager Robin Ventura for arguing a ball four call in the top of the 7th inning of the Tigers-White Sox game. With two out and none on, Tigers batter Miguel Cabrera took a 2-2 slider from White Sox pitcher Matt Albers for a called third ball. Replays indicate the pitch was over the outer half of home plate and below the hollow of the knee (px .368, pz 1.681 [sz_bot 1.65 / MOE 1.73]) and all eligible pitches during the at-bat were properly officiated, the call was correct. At the time of the ejection, the Tigers were leading, 8-7. The White Sox ultimately won the contest, 10-9, in 12 innings. This is Mark Carlson (6)'s first ejection of the 2016 MLB regular season. Mark Carlson now has 7 points in the UEFL Standings (3 Previous + 2 MLB + 2 Correct Call = 7). Crew Chief Paul Emmel now has 2 points in Crew Division (1 Previous + 1 Correct Call = 2). This is the 74th ejection report of the 2016 regular season. This is the 29th Manager of 2016. This is Chicago's 5th ejection of 2016, T-1st in the AL Central (CWS, MIN 5; DET, KC 3; CLE 1). This is Robin Ventura's 3rd ejection of 2016, 1st since May 6 (Bill Miller; QOC = U [Warnings]). This is Mark Carlson's first ejection since September 11, 2015 (Buck Showalter; QOC = U [Warnings]). Wrap: Detroit Tigers vs. Chicago White Sox, 6/13/16 | Video available via "Read more"